Titus Hybrid Celery | Henry Field's Seed & Nursery Co. Produces rich-green, non-fibrous stalks with excellent texture and taste! A favorite in our trials, Titus exhibited a depth and richness of flavor never found in grocery bought celery. If you've never tried growing your own celery we highly recommend it! 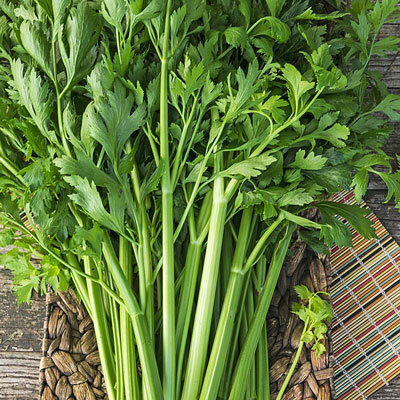 With a good resistance to bolting that allows for a longer harvest period, this delicious celery is fast growing and produces heavy, early-maturing, high-quality yields. 85 DAYS. Germination 14 - 21 days. Spacing: Set transplants 6-8 inches apart in the garden. Depth: Sow on the soil surface and lightly cover with compost or vermiculite. Foliage: Green parsley- like foliage. Fruit: Excellent quality, long smooth petioles, medium green.